Phyum’s family has few possessions; a grill for cooking, blankets for sleeping, head lamps for seeing at night and a few old toys for the children to play with. As a poor, single parent, Phyum and her family are vulnerable, but with increased social service provision life is improving. “Now, after I come back from the farm, there is water available. There is a road to travel home on and electricity. It is easier for us to live,” she said. 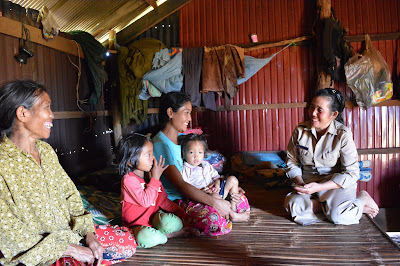 Phyum and her children live in a community that values social services more than most. For families in such a marginalized area, these services protect their safety, provide them with new opportunities and can even be the difference between life and death at times. Phyum has faced tough times in her young life. Her husband was sent to prison after being found guilty of domestic violence. Her meagre income as an agricultural worker is not enough to provide for her family, but with help from her community, her children can go to school and be provided with a meal when Phyum has not earned enough money to buy staple items, such as rice. “The help makes life better. My son can study at night. If the teacher is not showing up, I can complain to the commune,” she added. “The commune can help when there is violence in the family. They also teach us about the birth registration [process] and sending our kids to school. It helps my children. The civil registration will help them go to school and when they are older, to get work. Commune support is really important for my children’s future,” said Phyum. Seeing the adversity facing many in their community, Senmonrom commune officials have increased their investment in social services to improve child health and quality of life for families. They have increased their social service budget from 10 to 15 per cent, and want to invest more to expand and improve the services they provide. Senmonrom commune chief Thuan Threl said social services are necessary to reducing poverty and creating equity in the community. “The commune is like the peoples’ parents. The people expect the commune to support the community. Providing access to education is also critical to the growth of a human resource base that will be better equipped to contribute to ongoing national development. One important approach to aiding societal growth is empowering women. Doung Paan, chief of the District Women and Children’s Consultative Committee, said: “Women are the mothers of the world. Women have a lot of responsibility, at work and at the home. Increased social service provision has also yielded positive results in other areas, such as enhanced awareness about preventative health. More mothers are now bringing their children to community health centres after recognizing the benefits of immunization. Commune chief Threl confirmed that disease control is now more manageable, with less of a burden on financial and human resources within the local healthcare system. With technical support from UNICEF, the commune is also utilizing initiatives, such as a tool called social service mapping. This innovative, yet simple approach allows authorities to effectively identify the most vulnerable people in the community and how to best support them. Implementing social service mapping has also changed local leaders’ approach to addressing community needs. Now, they engage more with community members and talk to them about their lives and get important feedback. This has led to dramatic changes for community members. “Now, we interact with the community more. Now, we know their needs,” said Threl. The system works by mapping out the commune and marking at-risk households through visiting villages and conversing with residents to assess their needs. Authorities have a list of 17 indicators to determine vulnerability within the community and households with the most indicators are prioritized. By developing this map bi-annually, the commune is able to monitor progress and identify emerging problems so officials can act effectively. Direct interaction with community members has also helped locals feel more comfortable raising issues with officials. For villagers like Phyum, this is very important. “Now, I can talk about what the commune is doing, or not doing, easily. I can talk in front of the commune chief and raise an issue. The commune chief is more involved with the commune and me and knows what the village needs,” she said. Threl hopes to continue improving social services in her commune. To do so, she needs more support from provincial and district governments, as well as cooperation from health centres and civil society organizations. With four children to raise and limited pay, Phyum is especially appreciative of community backing. With continued support, she expressed hope her children will lead better lives and be able to contribute back to society.